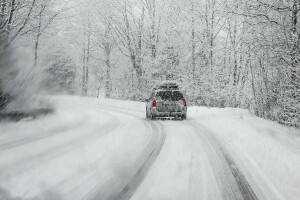 It’s important for every driver to know how to drive in winter weather conditions. It can be challenging to drive in these conditions, but with the knowledge of the information below, you’ll know how to stay safe on the road. Be sure your car has plenty of antifreeze. You do not want to run out while driving in poor weather conditions. Make sure your windshield wipers are in good condition and that your wiper fluid remains full. Dirty roads can cover a windshield with dirt quickly impacting your visibility. Keep control of your vehicle by not using your cruise control settings. Pack the essentials in your car in case you get stuck. A flashlight, roadside visibility reflectors, a snow brush and ice scraper, jumper cables and a bag of sand to help with traction are all key items that can help you deal with winter weather. Always check the road conditions before you leave on your trip. Once you know the weather conditions, be sure to leave earlier so you don’t have to feel rushed. Giving yourself the extra time allows you to drive at an appropriate and safe speed. Brake appropriately on slippery surfaces. If you start to skid, take your foot off the accelerator until you regain traction. Many people want to slam on the brakes when they notice their car starting to skid. Give yourself more distance between the car ahead of you. When the weather conditions are poor, you will need more space between the car ahead of you to stop. Know where to be extra cautious. Bridges, ramps, overpasses and shaded areas are likely to freeze first and can be extra slick. To defrost your car, turn on your front and rear defrosters. Don’t use your windshield wipers. Once your car has warmed up slightly, use your plastic ice scrapers. Knowledge is the first step to becoming a safe driver. Having the awareness and driving skills can help you stay safe in less than optimal weather conditions.